Turn left on Monmouth Blvd. and go to the second stop light. (Monmouth Blvd. 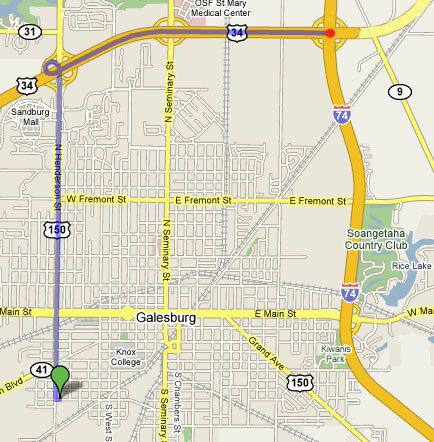 & Henderson St.) Turn right on Henderson St. Midstate Manufacturing is 4 blocks south of the stop light on the corner of Henderson St. and Third St., or right across from the Galesburg water tower. Get off at exit 51. Turn left at stop sign, drive over the interstate. Turn right towards McDonald's. Stay on this road for approximately five miles. After one mile you will come to a stop sign at Route 150, go straight. At about 4 miles you will come to a 4-way stop with a flashing red light, go straight. In the next mile you will cross over a bridge that goes over the rail yards. As you start down, at the base of the bridge turn right on S. Henderson Street. You will cross a set of tracks, ADM will be on your right side and Butler Mfg. on the left. 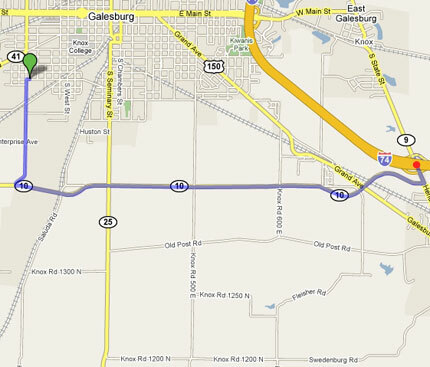 We are just beyond, on the right side across from the Galesburg water tower.